Is it possible that something else exists beyond existence? Yes. Here are five theories about what that "something" might be. The "outside the universe" question gets tricky right off the bat, because first you have to define the universe. One common answer is called the observable universe, and it's defined by the speed of light. 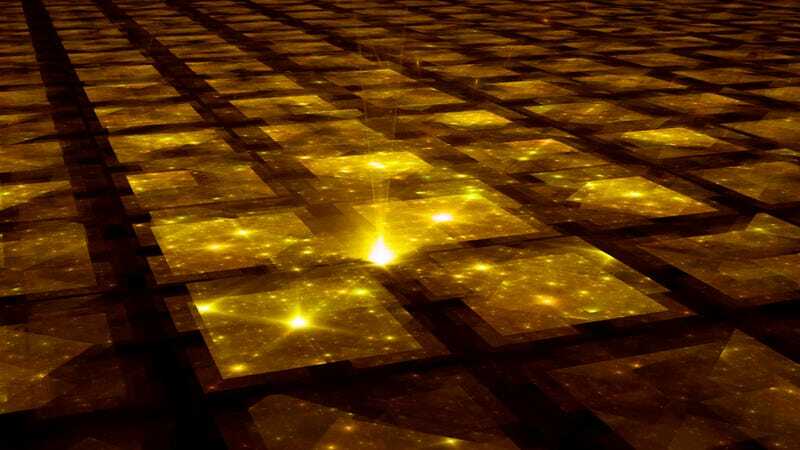 Since we can only see things when the light they emit or reflect reaches us, we can never see farther than the farthest distance light can travel in the time the universe has existed. That means the observable universe keeps getting bigger, but it is finite – the amount is sometimes referred to as the Hubble Volume, after the telescope that has given us our most distant views of the universe. We'll never be able to see beyond that boundary, so for all intents and purposes, it's the only universe we'll ever interact with. Beyond the Hubble Volume. We know with some certainty that there's "more universe" out there beyond that boundary, though. Astronomers think space might be infinite, with "stuff" (energy, galaxies, etc.) distributed pretty much the same as it is in the observable universe. If it is, that has some seriously weird implications for what lies out there. Beyond the Hubble Volume you won't just find more, different planets. You will eventually find every possible thing. Read that again and let it sink in. Everything. If you go far enough, you'll find another solar system with an Earth identical in every way except that you had cereal for breakfast this morning instead of eggs. And another where you skipped breakfast. And one where you got up early and robbed a bank. In fact, cosmologists think that if you go far enough, you will find another Hubble Volume that is perfectly identical to ours. There's another version of you out there mirroring your every action 10 to the 10^188 meters away. That may seem unlikely, but then, infinity is awfully infinite. Infinite Bubbles. Talking about things outside the Hubble Volume might be a bit of a cheat, since it's still really the same universe, just a part of it we can't see. It would have all the same physical laws and constants. In another version of the story, the post-Big Bang expansion of the universe caused "bubbles" to form in the structure of space. Each bubble is an area that stopped stretching along with the rest of space and formed its own universe, with its own laws. In this scenario, space is infinite, and each bubble is also infinite (because you can store an infinite number of infinities inside a single infinity). Even if you could somehow breach the boundary of our bubble, the space in between the bubbles is still expanding, so you'd never get to the next bubble no matter how fast you went. Black Hole Spawning. A theory proposed by physicist Lee Smolin, known as the fecund universes theory, suggests that every black hole in our universe causes the formation of a new universe. Each universe will have slightly different physical laws than the forerunner universe. In this way, Smolin suggests a sort of natural selection for universes, as laws that lead to the frequent formation of black holes lead to the creation of more universes, while non-black hole forming universes "die out." This theory has since been discounted (by Smolin himself and others). Many Parallel Universes. There are tons of theories about parallel universes, but the most accepted one these days involves an evolution of the ideas of string theory to involve membranes that vibrate in other dimensions. It's beyond the scope of this article to get too detailed about string or membrane theory, but the upshot of the whole thing is that these rippling membranes in the 11th dimension are whole other universes, and when the ripples slam into each other they form a new universe. The effects of the rippling motion help explain the observed distribution of matter in our universe. One of the weirdest elements of the theory is the idea that all the gravity we experience in our universe is actually leaking into it from another universe in another dimension (which explains why gravity here seems so weak compared to the other fundamental forces). Johnson, George. "A Universe of Universes." New York Times. Roach, John. "New Proof Unkown 'Structures' Tug at Our Universe." National Geographic.